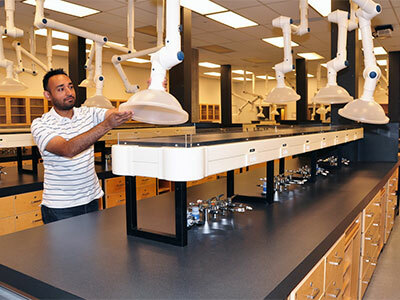 Picture this scenario, you need to move some lab chemicals to a new location across campus. No big deal, you'll get some of the students to help load the bottles into a cart to transport them. No need for protective clothing or goggles since you are just taking them out of the cupboard and into the cart, right? But college students being who they are can’t resist the temptation to open some of the bottles to see what is inside. They pick up a bottle labeled picric acid that has crystals formed around the lid, attempt to open it and then BOOOOOM!! Relocating a laboratory and its contents can be a dangerous process if safety procedures are not followed to the letter. One of the most dangerous aspects of moving a laboratory is the safe handling of chemicals. It’s important that lab personnel understand how to safely move chemicals when relocating to a new laboratory. This post will outline the basic chemical handling and storage precautions to practice when moving between labs and buildings. Step 1: Perform a Pre-move Visual Inspection and Inventory of the Chemicals That Will Be Moved. Regardless of who will be handling the move, either laboratory staff or an experienced and licensed environmental company it is important to first understand the chemical characteristics of the materials to be located. Here are the steps. Make a list of the chemicals and note of the type (e.g. Acid, Base, Reactive, Toxic), and amounts of the chemicals to be moved. Make sure that each container is correctly labeled as to its contents. Observe the general condition of each chemical container. Observe each containers cap or closure seal for the formation of crystals. CAUTION DO NOT TIGHTEN, OPEN OR MOVE CONTAINERS THAT HAVE CRYSTALS FORMING ON THE CAPS AND SEALS. Observe whether crystals, which could be the signs of decomposition, have formed INSIDE the container. Ethers and other classes of organic peroxides can decompose and produce potentially dangerous and explosive crystals. Step 2: Locate the Materials Safety Data Sheet (MSDS) For Each Chemical to be Moved. When moving chemicals, locating the MSDS for your chemicals may the most important step. Material Safety Data Sheets contain information that helps in identifying the proper methods of handling the chemicals. Chemicals usually have different characteristics that need to be understood. The MSDS data sheets include both the physical and chemical properties of the substances in question. For starters, the boiling point needs to be clearly stated. This is when the chemical will transform into a gaseous state. The vapor pressure, which indicates the evaporative ability of the chemical, is also significant. Volatility is measured here. Each MSDS has chemical specific handling and safety information that must be properly followed in order to move the chemical safely. Step 3: Plan The Move. The planning process needn’t be complicated. By employing some common sense and careful planning, you can create a game plan that keeps your everyone safe. First determine, based upon the chemicals in your lab you need to determine if your employees can handle the move or whether an outside environmental company should be hired. Once your moving resources are determined, you should prioritize what needs to be moved, and what needs to be thrown away. Don’t move more than you need! This includes outdated or broken equipment, chemical, biological, or radioactive supplies and materials. The move provides a good opportunity to take stock and pare down. Finally, chose the best route to take from your old lab to your new one. If moving inside of the same building, do not to take containers up and down stairs if possible. This will increase the risk of a spill. Step 4: Prepare The Chemicals for The Move. Care must be taken when preparing chemicals for the move. First and foremost, personal protective equipment including goggles, gloves and aprons should be worn before handling any chemicals. It’s important to group the containers for the move by Hazard Class. Do not move acids with toxics, or oxidizers with organic solvents. Make a separate move for each Hazard Class. Transfer salvageable chemicals from deteriorating or contaminated containers to new containers with new labels. Properly dispose of unsalvageable and excess chemicals as Hazardous Waste. Box chemical containers if possible, using the correct packing materials (e.g. Vermiculite, originalpackaging boxes, etc.). If you use a cart to move containers make sure it has rails so the containers don’t slip off. Place heavy containers on the bottom rack of the cart. Do not over load the cart, make several trips if necessary. Finally, make sure that you have a chemical spill kit with you in the event you have a spill along the move. Step 5: Compressed Cylinder Handling. Removing regulators from the cylinders before moving. Replacing the metal valve cover on the cylinder before moving. Move the cylinder with a cylinder dolly made especially for moving cylinders. Make sure the cylinder is securely chained or strapped to the dolly. DO NOT lay cylinders on their sides. Laying a cylinder on its side can cause condensed liquids in the cylinder to enter the valve. When the valve is opened the liquid can rapidly volatilize and expand. This can produce potentially explosive conditions. Extra care should be taken when moving chemicals. A small accident can become an unmitigated disaster in a matter of minutes if the wrong chemicals are involved. Prepare for the worst and follow these tips to reduce potential damage. Stay with the containers. Do not let them out of you sight while you are moving them between laboratories. before they get close to you. If it begins to rain while you are outside of a building you will need to find safe cover for the containers. Have your spill kit available as well as the phone numbers to call in the event you have a spill along the move. By following these basic chemical handling practices during your move, you can ensure your safety, as well as the safety of other people around you. If the job appears to be too difficult for your staff to handle, a licensed and experienced environmental company is a completely viable alternative.